Bottlenose dolphins (Tursiops truncatus) hunt with sponges by extracting prey organisms on the sea bed. Human cultural behaviour also involves activity like this, with "homophily" or copying behaviour is evident. If a child sees his parent using a tool it frequently follows that a sport or hobby is taken up by that individual. Social learning is taking place in both cases and at least in shark bay dolphins, we have an open and very dynamic community in which the research tries to determine if similar "spongers" associate together. This would demonstrate true homophily. While critics originally raved at the silliness of dolphins being able to use a sponge as a hunting tool, they soon realised that the sponging animals used this tool more than any other tool-using animal. It was obviously a valuable aid to their activity. What clinched it was the fact that only a proportion of the dolphins in a group are spongers, hunting the deep channels where a sponge can help them detect their prey. Other dolphins don't hunt there, simply because they can't! As spongers form a small sub-set of the community, the acid test for homophily is the sponging group and whether a social preference exists between the members for each other. The sponging is individual-it would be difficult to have more than one dolphin inside a deep channel, scraping the rocky sides. In particular, horizontal information transfer would pass on information about where to find sponges. The hypothesis tested therefore is the "homophily hypothesis." Above: Map of study area and dolphin centroids or "social centres". Monkey Mia is our boat-launching site. 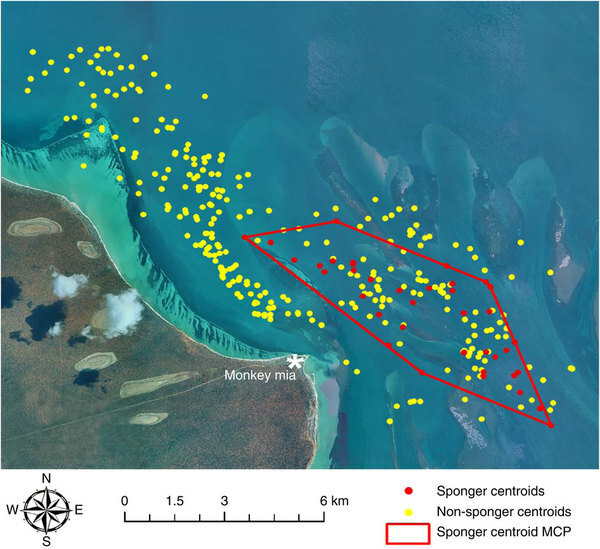 The MCP area outlined in red (22 km2) encompasses centroids for all spongers and contains 105 dolphins. Dolphin home ranges are typically at least twice the size of the core area27, which allows us to ensure considerable overlap between spongers and non-spongers in the Sponger centroids are red; non-sponger centroids are yellow. There are kin-based networks in Shark Bay in Western Australia, where males can form long-term alliances, but otherwise the social system is quite loose and has no emigration. Both males and females sponge and a parent is always the "teacher", although many dolphins do not follow their parents' sponging occupation. The activity only took place in certain areas. A boat was taken from Monkey Mia and associations between spongers and non-spongers noted. Female spongers tend to be more solitary than female non-spongers, so males were compared on this study, in order to note gender differences. The males turned out to be less solitary, although sponging males were more solitary than non-spongers. However the behaviour having been transmitted by a parent ("vertically"), created a clique of Tursiops that had more sponger associates and stronger bonds than non-spongers. This is a first for a social preference in animals based on tool-use, implying this is evidence for a first non-human subculture. Male dolphins really did let the side down in the experiments, although their inclusion made the research more valuable. They didn't significantly associate with their fellow tool-users. All were young adults, but male dolphins have these long-term associations that could prove difficult for solitary spongers. The social network analysis determined that out of 105 dolphins, studied for over 22 years, homophily was proved. Tool-users preferred others like themselves, literally sharing their sub-culture, rather like their human counterparts who share cultural activity. The authors, Janet Mann, Margaret A. Stanton, Eric M. Patterson, Elisa J. Bienenstock and Lisa O. Singhfull have published their research paper, Social networks reveal cultural behaviour in tool-using using dolphins, in the journal Nature Communications.